Holy Week is termed Àmbęlat Àgęw (again, all e's pronounced gutturally) in Pangasinan. It literally means "heavy day/s." I believe the term has profound psychological effects, since Holy Week has a pervasive air in the province. Maybe it has much to do with people being still very conservative when it comes to religious observances. All the same, as a child I remember Holy Week being sultry, the heat weighing on everything, and aggravated by the fact that you have to maintain a serious face all throughout. 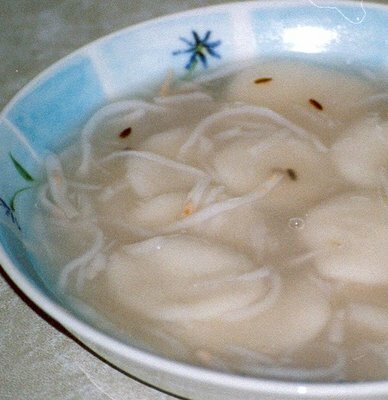 Coupled with the general weightiness of the entire atmosphere is the fact that Lent, despite the heat, is characterized by the consumption of ansak-kęt (malagkit, glutinous rice), which is heavier than ordinary rice (it lands like a dead weight in the stomach). I don't know why, but this has always been the case. Maybe it has something to do with harvest time (I've been getting many calls lately, informing me that I can pick up my rice and glutinous rice ration), and the seasonality of the ingredients, mainly rootcrops. The standard partner with which ansak-kęt is cooked - coconuts - is available year-round, though. Anyway, I'm very unconventional, but family traditions which have been observed since childhood have gained sacred status that are very difficult to uproot. And so once again, I will be cooking and eating ansak-kęt, in its many variants. Inspite of the heat. Our version of palitaw, called unda-unday or unday-unday, is syrupy, and so does away with the "dry" toppings of grated coconut, sugar and toasted sesame seeds. It uses the same thin wafers of glutinous rice dough which are cooked once they rise out of the boiling water (that's why they are called palitaw, which means "rises up" or "pops up"), which are then mixed into the sweet sauce. The term unda-unday evokes a vision of rolling plains or sand-dunes for me. I don't know if that's why it's called such, but it is how it is known up to now. To make, soak desired amount of glutinous rice in water overnight. Grind the following day (most wet and dry markets have grinders, usually near the coconut graters). Take small pieces one at a time, forming them into thin discs approximately 2 inches in diameter. Spread each disc onto a plate - never stack one on top of another. Boil a pan of water. Drop several rice discs onto the boiling water. Take out with a ladle each disc that goes up from the bottom of the pan to the water surface and lay on another plate. Repeat with the rest of the discs. Boil about two cups of water (or more, depending on the amount of palitaw) with half a cup of white sugar (again, amount depending on desired taste), some anise seeds and slivers of young coconut meat. Stir until thick, but still runny (sauce will thicken some more when the palitaw are added). Mix in the cooked palitaw, and cook to desired consistency of sauce. Can be served hot or cold. Another way to cook palitaw with sauce is masikoy. though i am not a roman catholic, i miss the pall of gloom that Lent brings. we live near the plaza back home and the Holy Week rituals has been part of my life. The procession of antique carozzas, I miss. Where I am now, people focus more on Easter and it more of a happy celebration. We also make palitaw but without the syrup.We call it muasi/ mwasi. It's drizzled with shredded dried coconut and a misture os brown sugar with lungga(sesame seeds). mwasi though, i identify with Fiesta Minatay on Nov. Ist. Hmm, that's interesting, Angelo, mwasi on All Saints' Day. But it's funny you miss the pall of Lent. Easter is actually the most important event in the Catholic Church (and probably in all Christianity, though I'm not sure), and should be celebrated accordingly, but we are bogged down by the preceding observance of gloom. Lenten na lenten talaga ang dating ng dish mo but I never try anything like this with coconut sauce - ano bang lasa? Anyway, I'm sure na nag-e-enjoy ka na ngayon kung saan ka man naroroon- ingat nalang po! that is tasty and i miss those childhood days... Palitaw is that they same as Unday-unday (pangasinan term) the other on is " masikoy" which is drier.... what's next tambo-tambong ? My hubby loves palitaw so much, pero ako hindi masyado. I will try this one and maybe I can also add some buko juice sa syrup for a more authentic buko taste. Wala lang, feel lang. back in laguna, we have more or less a similar preparation called "undi-undi" or "unday-unday" but without the buko strips and sesame seeds. the syrup is thicker. pandan leaves are used for soulful flavor and aroma. it is not identified with holy week or easter sunday though... it is an all-year round delicacy. but i remember savoring it in the heat of summer's day. Yay, Bert and Yo, I've forgotten that term, unda-unday! Masikoy, too! But I don't know tambo-tambong, though, I'll ask the oldies. Lani, and thanks to you, I'll try the soup with buco juice. ei kai! this sounds yummy! our version in isabela or what we're used to having is the dry one. i think it's also called tambo-tambong . . . not sure though . . . tee hee . . . will ask when i go back home . . .
Bert, I wonder why it turned out that way, I've tried cooking buko juice with tinola. But thanks for the tip, anyway. Hey, Mang Mike, welcome back. Related talaga mga delicacies sa Pangasinan and Ilocano regions. Tambo-tambong is also known as bilo-bilo in tagalog or as I recall is also known as "kineler". Oh, I think we're in for a word game here. I'm not familiar with the word tambo-tambong, actually, but if it's an Ilocano ginataan dish and if it directly translates to kineler, then it must refer to another dish. That's because in Pangasinan kineler is ginataang bilo-bilo with saba, kamote, langka, and maybe ube, sago, buko strips, etc.